David Bryant brings you tales of the paranormal and bizarre! UFOs, ghosts, coincidences and conspiracies! One theory to explain all? You have heard much from the authors of this site and their correspondents on the subject of paranormal happenings... Perhaps you might be interested in my 'unified theory' as to their origin? Let me begin my thesis by considering those problematical phenomena, UFOs. Has it ever occurred to you as being a little outré that every generation witnesses strange flying craft whose technology is just a few years ahead of its own? In Ancient Rome, for example, people regularly reported sighting flying chariots: in the early nineteenth century it was sailing ships, followed by airships, strange biplanes, rockets and finally (and most recently) spacecraft. Think about this for a moment….why did the Romans or inhabitants of the American midwest last century not see disc-shaped craft? Or, to put the opposite point, why do we today not see square rigged sailing shops whose anchors foul church towers, as happened several times last century! Why should we witness phantom Roman Legions in York and not, say, Viking marauders? Why should the ghost of Anne Boleyn be seen at Blickling in Norfolk, and not at Hampton Court? She was equally at home in either location during her life time! Lake monsters? What about these, and other crypto-zoological conundrums? Why should innumerable tiny Irish Loughs be just as haunted by these unlikely beasts as their vast Scottish counterparts? And why should it be that scientific investigation time and time again absolutely establishes the impossibility of the existence of a large unknown creature in Loch Ness, yet reliable witnesses report sighting one year in and year out?! My thesis depends fundamentally upon a single assumption: that the Universe is inhabited by thousands of species of intelligent life far, far older than the human race. It is the currently held belief that the uncoupling of matter and energy that generated our Universe took place around fifteen billion years ago: massive stars condensed from primordial gas clouds, flared into life, produced heavy atoms in the crucibles at their cores and died in the appalling cataclysms of novae and supernovae. From the remnants, new stars like our Sun were created. In the ensuing five billion years, life began on our planet, culminating less than a million years ago with the appearance of human-kind. But what of the myriad life-forms that had undoubtedly evolved billions of years before, during the first wave of star-formation? Consider the energetics of heterotrophic life. Humans, like all mammals consume huge amounts of food merely to sustain the body: most of our daily calorific intake is used to maintain blood temperature, and to allow us to drag ourselves laboriously around in the Earth's gravity-pool in a ceaseless quest for more to eat! Respiration liberates the energy from our food through the complex and fundamentally flawed processes of glycolysis, the carboxylic acid cycle and the electron transport chain. The brain, which after all is the seat of our intelligence, uses only tiny amounts of energy! Imagine, if you will, a far older life form: one that has been evolving for billions of years longer than we have! Is it not at least conceivable that the need for a physical body such as ours might have been obviated? How might such raw intelligence meet its minimal energy needs? One must at least allow the possibility that such a life-form might function autotrophically, which is to say that it could extract all the energy it required directly from the environment. Extrapolate….this entity would no longer be tied to 'the surly bonds' of planetary existence: it would have no dependence upon oxygen to liberate energy from its carbohydrate intake! We are beginning to build up a profile of the possible development of intelligence in our Universe. Such an 'energy being' would be free to wander indefinitely through space, immortal, unassailable and presumably adding continuously to its knowledge. Occasionally our hypothetical entities must encounter inhabited worlds: rich pickings! They could drift unseen, feeding at will upon the raw mental outpourings of the population! Perhaps there might be an optimum 'size' for such an entity: when attained, it could divide and replicate itself! Now suppose such entities reached our planet in the distant past….by now we could be sharing the Earth with millions of super-intelligent, invisible life-forms, to whom we are as inferior as is a cockroach to us! A chilling thought! And suppose that at times they have the requirement for extra energy input….how might they stimulate us to provide this? I'm sure you have already reached the obvious conclusion: by manifesting themselves in some 'expected' form to generate the maximum psychic response from witnesses! They would only need 'bother' to do so at odd intervals: one twenty second 'show' at Loch Ness each year guarantees waves of alertly-expectant tourists, while who knows how much 'thought energy' is available to invisible diners at places like the Tower of London? One can develop this idea almost indefinitely: and like all good theories it fulfils the requirements of Occam's Razor: 'When a number of possible solutions present themselves, the simplest is usually correct' The Energy Being hypothesis has the particular merit of explaining why places such as Loch Ness are haunted by more than just water monsters, why UFOs always appear in a format credible to the witnesses, why the Blessed Virgin appears only in Catholic communities (such visions not being credible elsewhere!) and why the human race almost appears to thrive on fear: think of theme park rides and our fascination with horror……...a dreadful thought: are we being routinely psychically milked to provide nourishment for our heartless visitors?!!! I went to bed as normal on a Sunday night: the year was 1977. But when I awoke on Monday morning the dream I had had felt very real. My dream started in my childhood home: I was standing in my parents' bedroom, then started to walk to the bedroom door. I was going to go to the bathroom, but before I got to the door, the bedroom I was in wasn't that of my parents' but a quite different room. It was big and fairly dark and somewhat 'old world' with very rich colours.There was a big bed to my left. What happened next was what I can only describe as a premonition. I was standing in Elvis Presley's bed room. Elvis walked past me and to my mind he was heading for the bathroom. Before he got there, he stopped, turned round and was holding his chest. It seemed to me at that time that someone had shot him. He collapsed to the floor, seemingly in slow motion. This may sound odd, but I knew he was dying and, perhaps odder still, I felt he didn't want to die, but could do nothing about it. 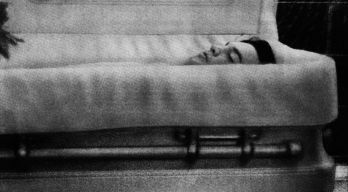 The next morning, when I got my daily paper the headlines read: 'ELVIS PRESLEY DEAD!' My work colleague said that when it came on the news that night, the hairs on the back of her neck stood up!